You know on those makeover shows like What Not to Wear when the hosts chastise the fashion victims for living in sweats? Well, they could have easily avoided that fate if they had just discovered the holy grail of fashion: the sweater dress. It’s perfectly acceptable to wear a sweatshirt! As your clothing! Check out some of the coziest and most fashion-forward options that will keep you comfortable and safely off reality television. 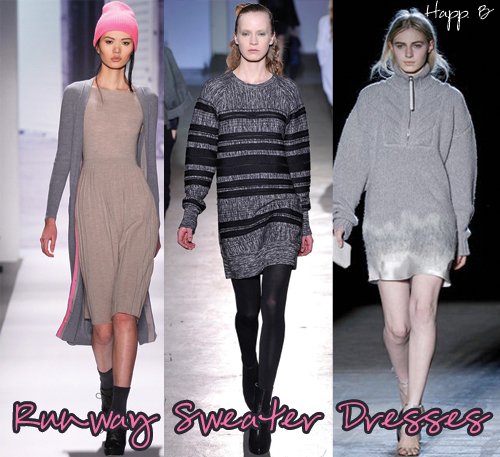 Sweater dresses look great with heels or ankle boots; and if you get cold, throw on some tights and extend their seasonal use. Please note that the last sweater dress is called the “Keanu Reeves Sweater Dress.” I wish I could know the origins of that naming decision. Do you exploit the sweater dress? What’s your favorite?